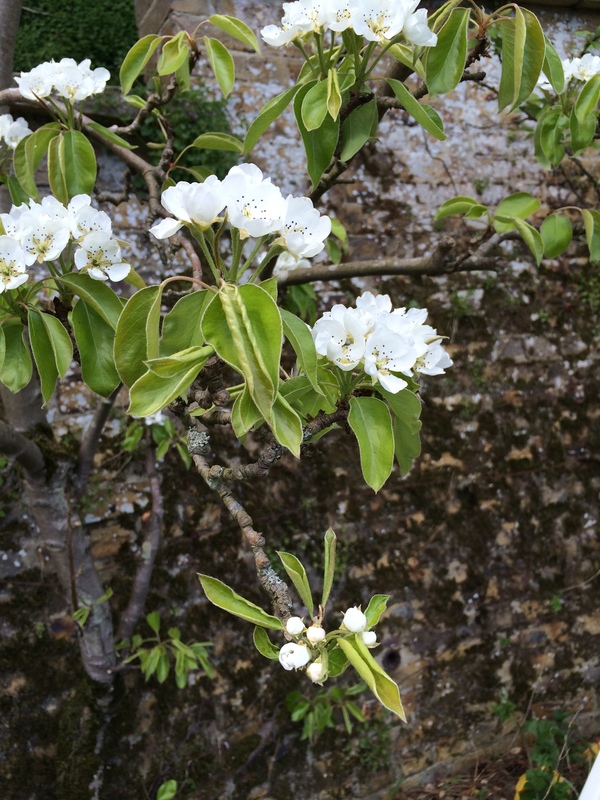 We have one pear tree in our garden growing against the south-facing back wall. I don’t know how old it is as it was already here when we moved in but it’s not a big tree. I think it’s a Conference – they look like Conference pears and they taste like Conference pears. Anyway, it’s been a good year for pears (and most fruit, I think) and we have lots and lots. My family aren’t great pear fans, so I’ve been looking for different recipes to use them up. 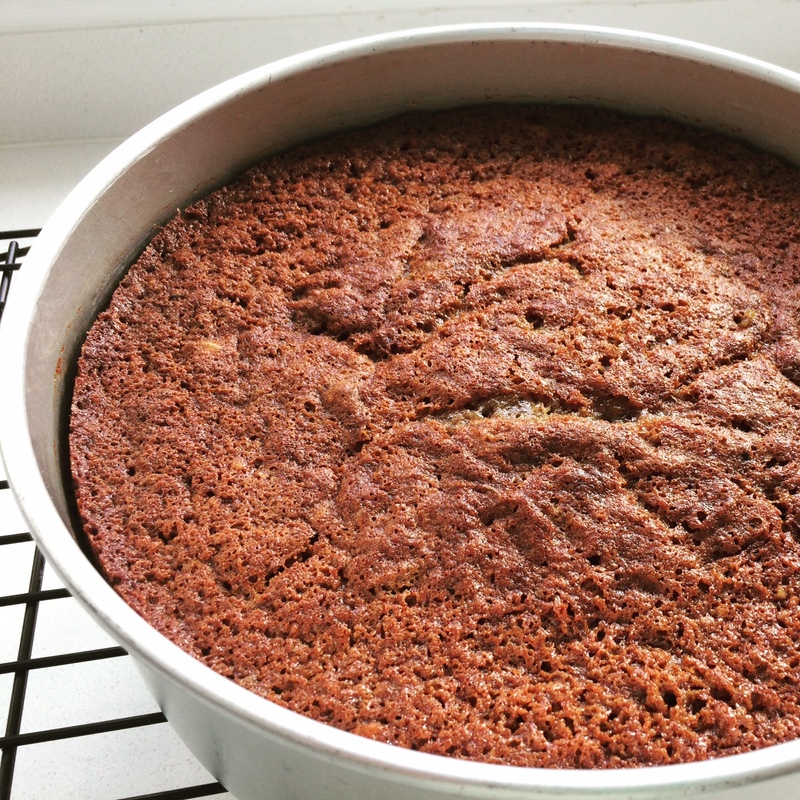 I made this Sticky Pear and Ginger Cake this morning and it’s been a big hit. (I didn’t follow the recipe exactly – I chopped all the pecans and added them to the cake mix and I omitted the syrup.) You could eat it warm as a pudding with yogurt or cream, but it’s delicious just as it is – moist, spicy and pear-y. I’ll definitely make it again. 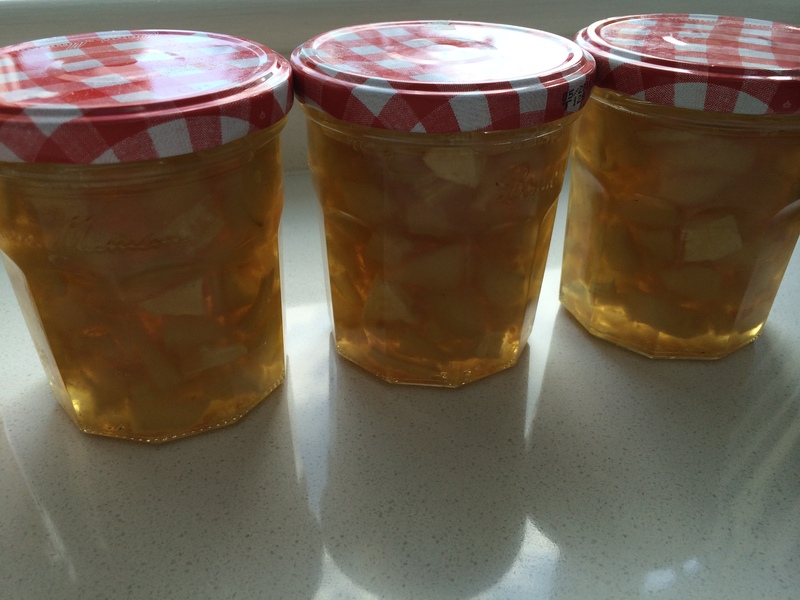 My mum and I also made some pear and ginger conserve a few weeks ago. This wasn’t as successful. The taste is lovely but it doesn’t work as a jam; it looks a bit like pineapple chunks in jelly! If I make it again, I’ll chop the pears up much smaller and use grated cooking apple to increase the pectin. I think we’ll be eating this alongside ice cream. Have you found any new ways to use up your produce? If you have a favourite pear recipe, I’d love to hear it! Wow, I don’t even like pears and these photos make me want to try them! 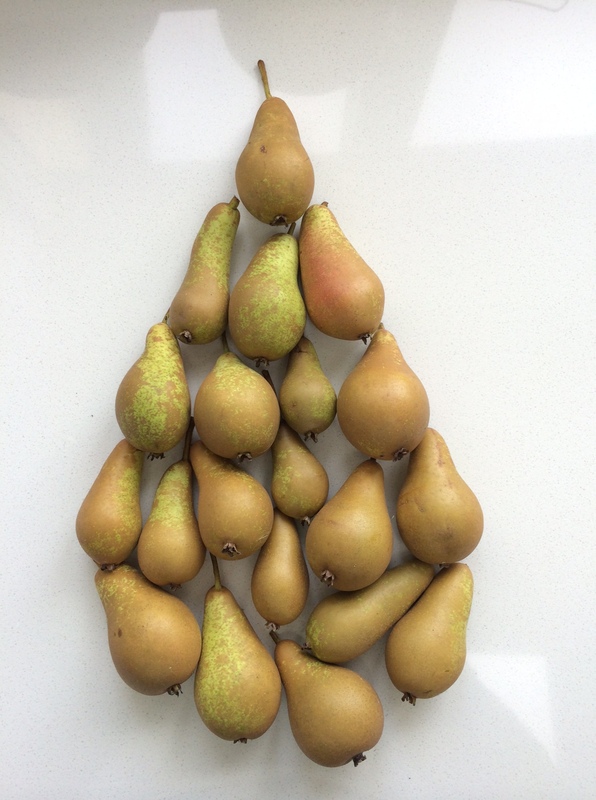 the pear-shaped pears, how to say that?, anyway rather fun! I spent a happy few minutes arranging them. My husband walked past and gave me an odd look! I love pears but keep them in the fridge because they go woolly so quickly. I make a pear frangipane tart with Williams pears and poach Conference pears in red wine to serve with billowy whipped cream. Comice pears are a special treat which we eat at Christmas. Ooh, now my tummy is rumbling. ‘Billowy’ – isn’t that such a wonderful word? 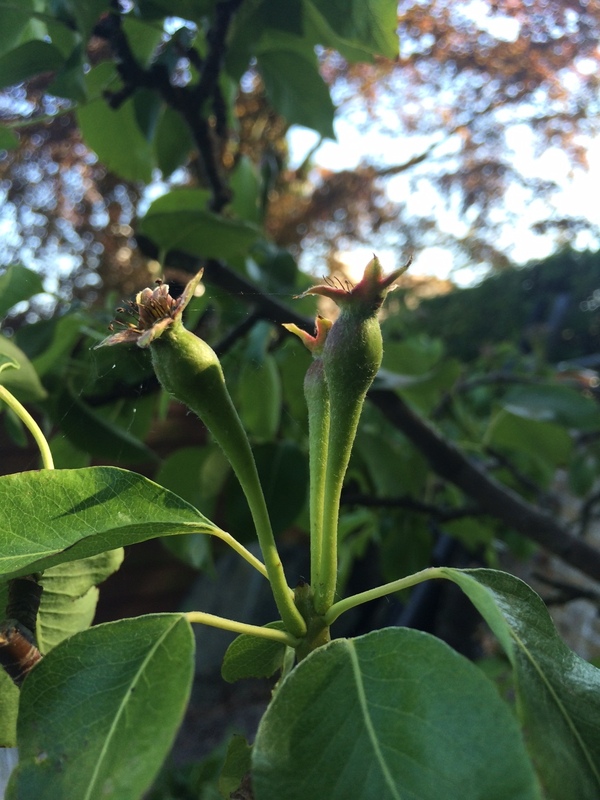 I have a feeling that pear trees fruit well every other year (but I may have made that up!). I like your pear pear. We have plenty of apples this year but only one solitary pear from three trees, so no pear preserves for us. Like CJ, we had a bumper crop last year so I’m not complaining. We did have quite a few apples on the low cordons but something helped themselves one night… I suspect a rather rotund badger. The pear pieces sunk in this cake too but it didn’t suffer for it. I do love a frangipane tart so I’ll give a pear one a go. I’ll have to up my dog walking distance to work off all the calories! Lucky you to have so many good pears! The cake looks lovely. We used to have a wonderful pear tree in our garden in Bristol, and each year bottled lots in a red wine syrup with some spices added (Kilner jar type of bottling). They were delicious, and the pears in red wine just needed some plain yoghurt or creme fraiche for a perfect simple dessert (or vanilla ice cream). Sometimes I buy a box of pears from our greengrocer to relive that experience. 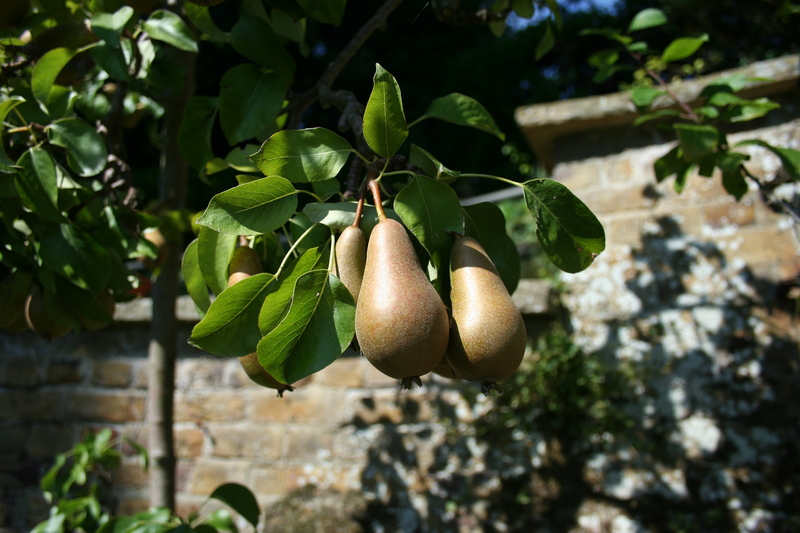 Am considering planting a couple of pear trees this year (but they’ll be maidens and take a long time before they produce). Bottling them is a great idea. 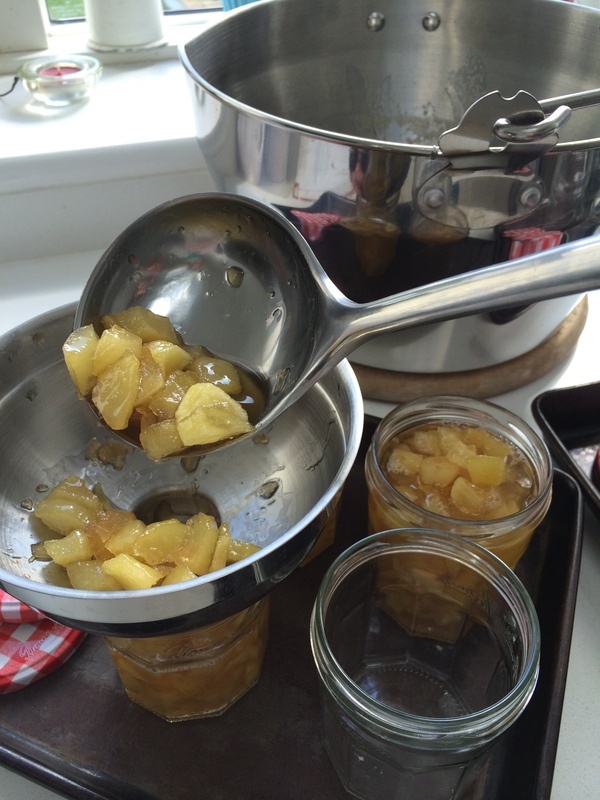 I love the idea of having a couple of jars tucked away for a taste of pear-y loveliness in winter. I’ve been thinking about getting a different variety tree too. I look forward to hearing about yours. Pear blossom is my favourite. How about pear belle Helene? Poached pears arranged over vanilla ice cream and hot chocolate sauce poured over. Delicious and easy. Pear frangipani tart is very popular here too. Yum. Anything with chocolate goes down well here. Thanks for the tip. Thanks for the recipe Sam. I have so many pears this year. Apart from poaching them in wine I never know what to do with them all. I hope you enjoy it if you make it. Ours disappeared very quickly. Yum! I love the taste of pear. For my birthday Judy bought a pear and raspberry pie – excellent. There’s also a kind of Serbian pear liqueur called Kruskovac that’s very good, and I don’t normally like liqueurs. 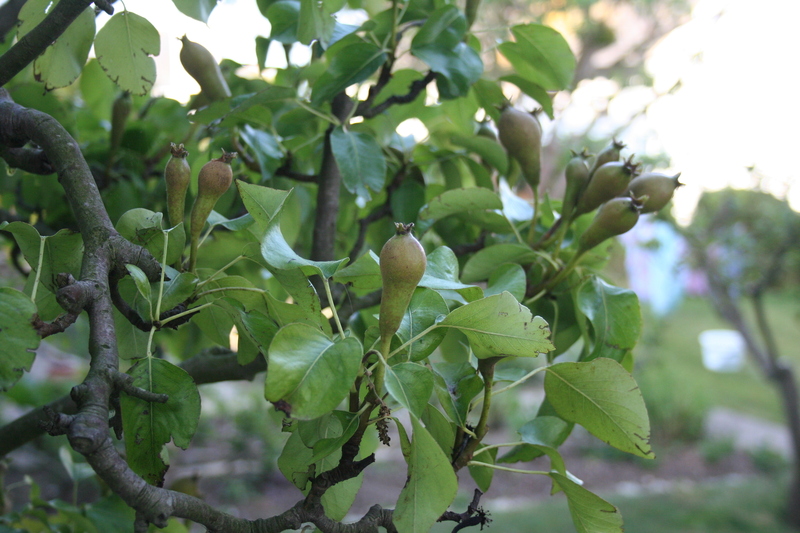 You are so lucky to have a pear tree! The cake looks wonderful, and I’m sure by now it is long gone. Have you ever tried dehydrating pears? They are delicious, and easy to do. I’ve not tried dehydrating pears, or any other fruit for that matter. I’ll look into it. Thanks for the tip. How lovely that you have Herdy there in BC. Brilliant post, love the pear made out of pears. 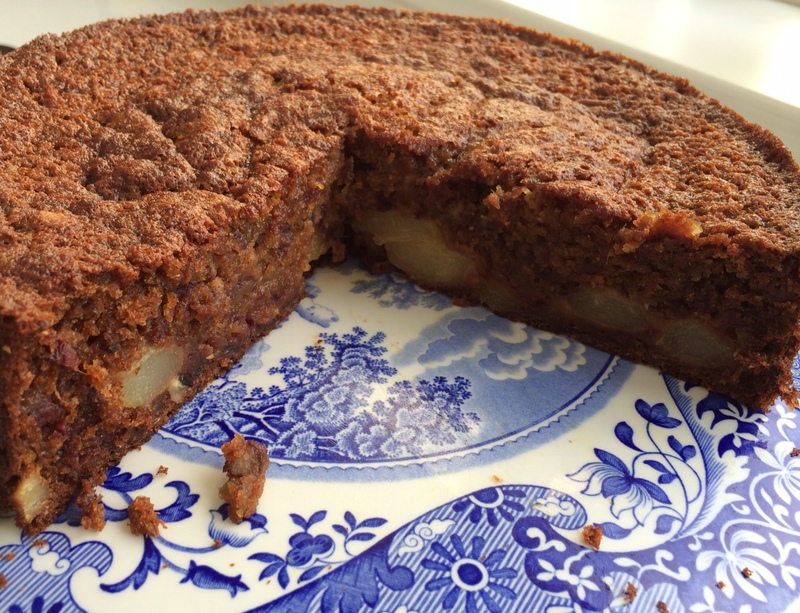 I made a good pear, chocolate and hazelnut cake last October but we don’t eat a lot of pears which is shocking considering Worcester has it’s own pear. Pear and ginger sounds a very tempting combination.